Another week, another late review. One of these days I’m going to get the hang of this. And what’s that? April 1st? Time for jokes and pranks and whatnot. Well, kinda, I don’t have quite the same elaborate gag-posts Ethan pulls off, but this week’s blaster is a joke in and of itself in a way. That’s me saying it’s bad. It’s a bad… you know what? Nevermind. On to the review. It’s the Marvel Captain America: Civil War Iron Man Stark Strike Gauntlet Blaster… from Hasbro. At least, that’s what the friendly marketing guy in the video ad for this product told me. It’s the longest name for a Nerf blaster I can think of since the Nerf N-Strike Accu-Zombie Elite Strike Fire Mega Fury Strike Rapid Modulus Strike Fire Strike Strike… from Hasbro. The MCA:CWIMSSGB… fH was released in 2016 as a tie-in product for the Captain America: Civil War film. The blaster uses spring power to launch the dart, but instead of using it to push a plunger into a cylinder to create air pressure, the spring just impacts the dart directly. I’ve mentioned this system a couple times I the past, largely in reference to how terrible it is, and that assessment holds true here as well. The body of the blaster is pretty good, actually, the main feature being that the actual blaster part pops up from the rest of the platform before allowing you to fire. The construction feels solid and the sculpt is all new with some painted gold accent work here and there. The only controls on the blaster are the two buttons on the back, one causes the blaster to pop up, the other fires. Interestingly, due to the nature of the firing mechanism, even if the blaster is primed, it can’t be fired without a dart in the barrel, I assume to prevent the spring from beating the crap out of the internals of the blaster. The strap is small but I can still get it around my adult-sized wrist without too much trouble. Unfortunately, the problem with arm-mounted blasters is that aiming is pretty much out of the question. They say you can’t lick your own elbow, and it seems just about as impossible getting a sight-picture with it too, not that aiming would improve your chances of hitting anything with this blaster. As said before, calling the ranges on this blaster “disappointing” would be the understatement of the month, that is, if it fires at all. More often than not, the shock of the top part snapping up into position is enough to shake the dart forward in the barrel to where it no longer presses on the firing lock, meaning you have to re-seat the dart before the blaster will fire. If it does work, then you can watch the dart go flying up to about 10 or 15 feet. Woo… So unless you have some really emotionally fragile siblings, this blaster won’t help much when you decide to bust into their room and light them up. It’s probably best to leave it back in your room. The Marvel Captain America: Civil War Iron Man Stark Strike Gauntlet Blaster… from Hasbro comes with 2 Eilte darts in red and black but I seem to have lost mine, oh well. I think It really says something about a blaster when the most enjoyment I’ve gotten from it is hearing the guy in the ad say the full product name and almost forget to mention it’s from Hasbro. Sure I like gimmicky blasters, but that’s predicated on them being blasters first, and this one is pretty awful. Heyyyy jokes! But seriously, though, I wouldn’t recommend this blaster. Hey there FiQ-fans! Rather than continuing the Voltron love with a Keith review, today I will instead be turning back to one of my old faithfuls, Marvel Minimates. It’s been a fair while since I’ve looked at anything from this line, so let’s make up for that, and take a look see at Scarlet Witch and Vision! 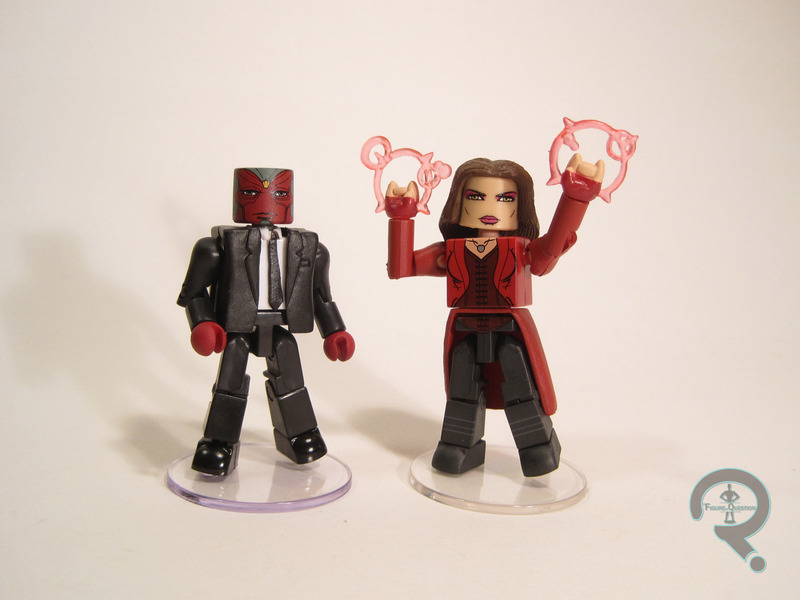 Scarlet Witch and Vision were released in the summer of 2016 as a SDCC-exclusive two-pack. 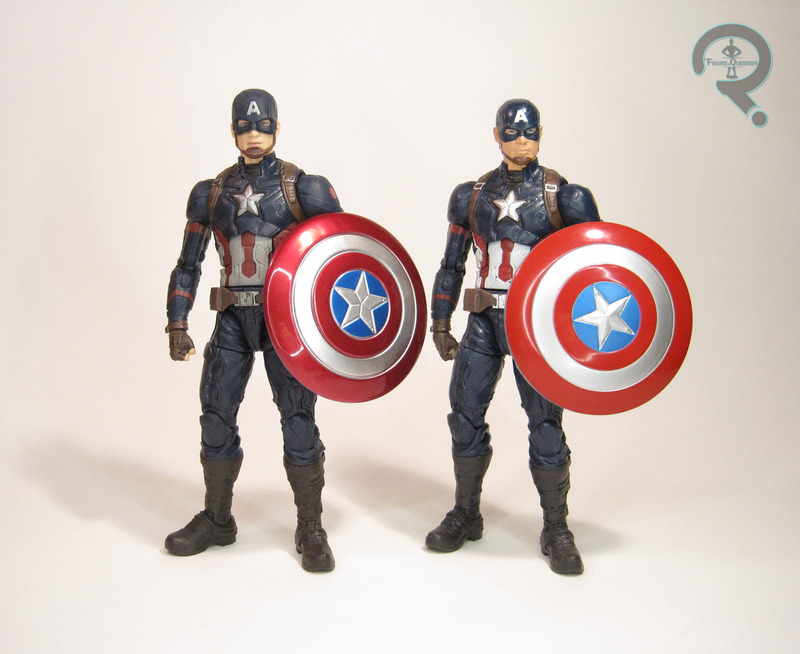 Both figures are based (theoretically) on their appearances in Captain America: Civil War. Wanda was the source of much contention when the Civil War ‘mates were first being unveiled. Despite being a central figure in the film’s plot, she wasn’t available in any of the retail sets. Fortunately, she turned up here. Yaaaaaaaay. The ‘mate sports her spiffy red jacketed look, which is certainly a nice design. The figure stands about 2 1/4 inches tall and has 14 points of articulation. She’s built on the standard ‘mate base body, with add-ons for her hair and the bottom segment of her jacket. 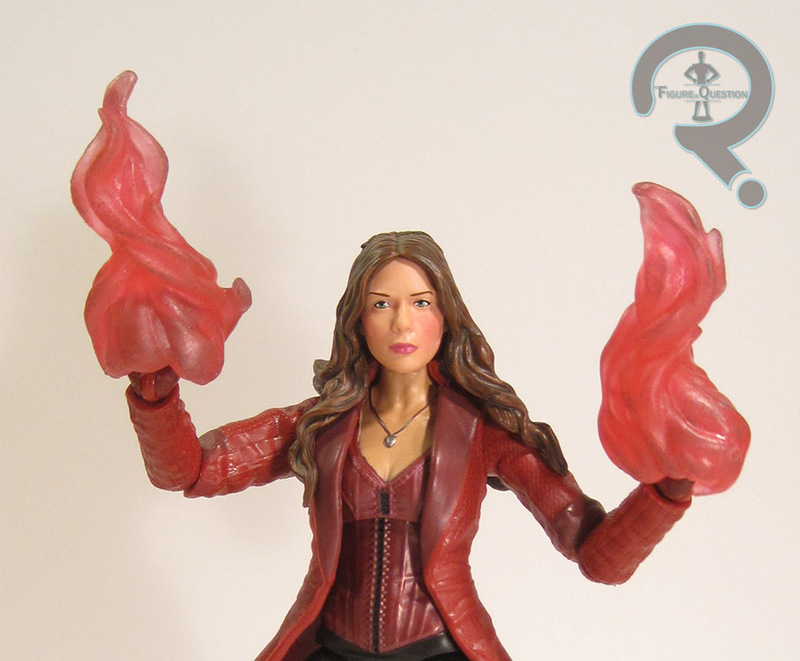 The hair is the same piece used for the AoU Scarlet Witch (which was itself a re-use from Series 50’s Songbird), which does at the very least sit a little better on this figure than it did the last one. That’s a plus, I suppose. The jacket appears to be new to this figure, and it looks decent enough. I do wish the segment between the torso and the pelvis wasn’t quite as obvious, but that’s fairly minor. The paintwork on Wanda is fairly solid work. It’s all pretty clean and the line work is nice and sharp. Once again, I do wish the center of the jacket piece were painted to match the two bits of torso on either side. Also, I’m not sold on the likeness on the face, but it’s at least still a nice looking face. Wanda includes a pair of spell-casting hands (borrowed from her comic book counterpart) and a clear display stand. There was already one Vision ‘mate from Civil War, which depicted him in his standard garb. One of the cool things Civil War did was put Vision is civilian clothing, which made for rather an interesting visual. This ‘mate captures that, but not in the most movie accurate way, strictly speaking. See, in the movie, he’s wearing sweaters and khakis and stuff; kind of a Cary Grant sort of thing. This ‘mate instead presents him in a fairly standard suit and tie, which we never see him wearing. He was supposed to wear it during Peggy’s funeral, but his scenes there were cut, making this ‘mate largely irrelevant. And it means we don’t get Vision in that sweet sweater get-up. For shame. Not really DST’s fault, though. This ‘mate gets add-ons for his jacket and tie, which are the same ones that have been the standards since the Senate Hearing Tony from Iron Man 2. Not a bad standard suit and tie. The paint is mostly limited to the head, which is the exact same piece we saw on the TRU-exclusive Vision from earlier last year. I preferred that one to the AoU release, and I do still really like it here. Vision’s only accessory is a clear display stand. I meant to get these guys way sooner than I did. I mean, I loved Civil War and everything, and I have a bunch of the ‘mates. But then the shipments containing these guys and the Punisher/DD set were super delayed after SDCC, and they just fell under my radar. My brother Christian ended up getting them for me over the summer, after he found them at GameStop for a sizable discount. I like both of the ‘mates here, but I can’t really say either of them is incredibly exciting. Vision’s not actually a design from the final film, and while Wanda’s new look is nice, she’s not so different from the last version. Still, not a bad set. It’s day 5 of the post-Christmas reviews, and today I’m jumping back to my biggest collecting passion, super heroes, specifically of the Marvel variety. 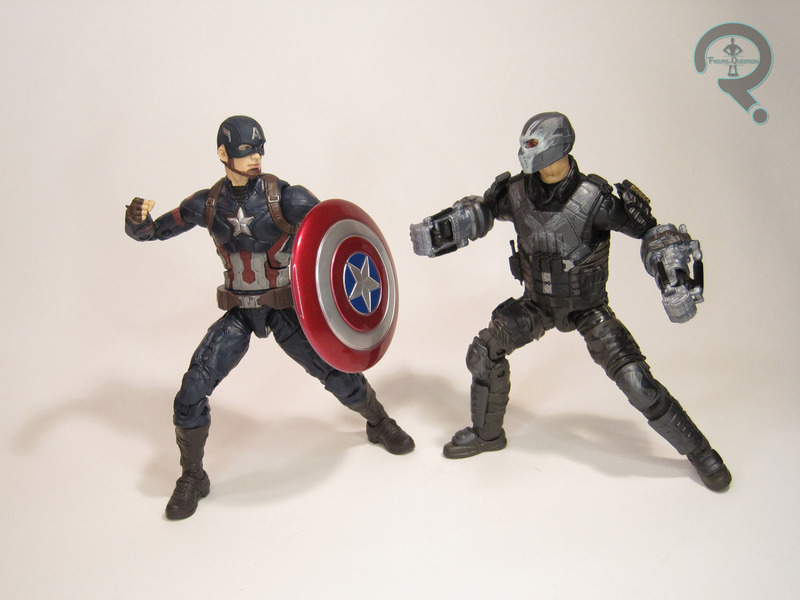 Back when Captain America: The Winter Soldier was released, I was quite put out by Falcon’s absence from Hasbro’s small selection of Marvel Legends based on the film. I picked up the smaller 3 3/4-inch figure and DST’s larger Marvel Select figure, but neither of them quite filled that Marvel Legends void. Fortunately, Falcon reappeared in last summer’s Civil War, which finally netted him a Legends figure, albeit one that was…slightly difficult to acquire. But I have it now, and that’s what matters! Onto the review! 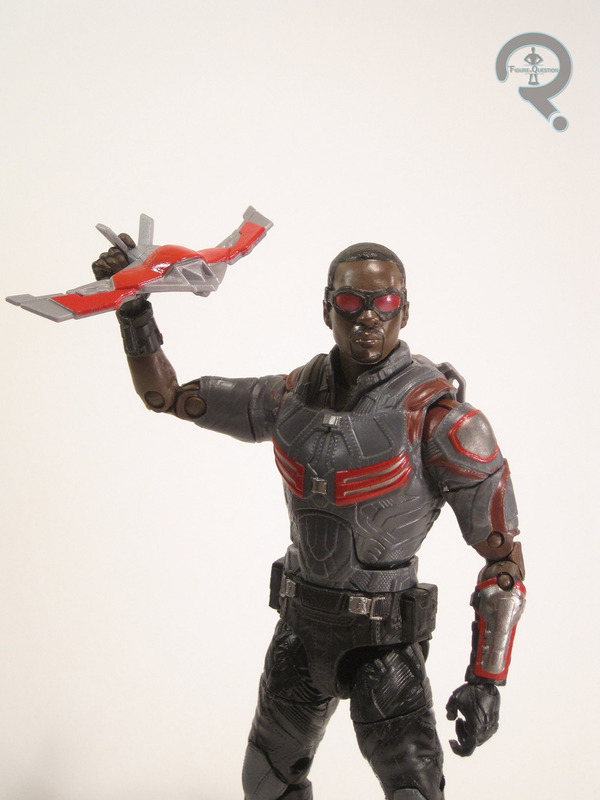 Falcon was released as a Walmart-exclusive entry in Hasbro’s Marvel Legends Series. He started hitting over the summer, but as with just about any Walmart exclusive item, there’s a great level of variance in terms of when they start showing up most places. When he was initially announced, Falcon was paired with Winter Soldier, presumably in a two-pack, but it when they actually showed up in stores, they were single-packed, just like a normal Legends release. The figure stands 6 1/4 inches tall and has 30 points of articulation. He’s based on Falcon’s slightly refined Civil War design. More or less. The actual costume details are a pretty decent match for the film design, with one or two slightly off details. The biggest issue is the shoulder pads, which should stand out a bit more, but that’s rather minor. Really, the inaccuracies come into play with the body underneath of the costume. Anthony Mackie is a pretty bulked up guy, but this figure is rather on the scrawny side, especially when it comes to the arms. Those things are tiny! The legs are also rather shapeless, which looks a little odd. All-in-all, he really could do with more classically “heroic” proportions. As it stands, he seems less than intimidating. 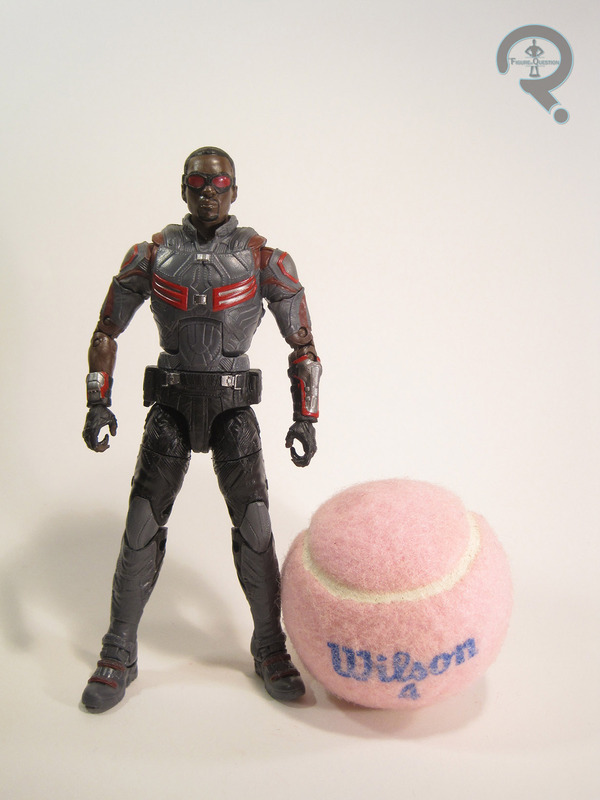 On the plus side, the head sculpt sports a very nice Anthony Mackie likeness. 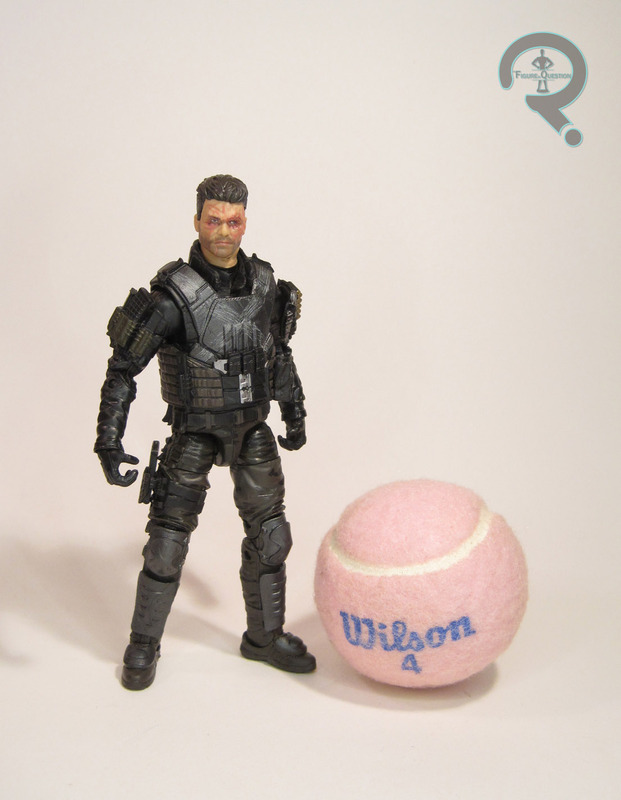 It’s easily the best Mackie likeness of the figures I’ve looked at so far. Falcon’s paintwork is okay, though definitely on the more basic side of things. The basic colors are all good matches for the source material and what’s there is pretty clean. That being said, he’s missing some of the smaller details (such as the gold trim on his goggles), and lacks any sort of accent work, which makes him look a little unfinished. The grey section in particular just feels rather doughy without any work to bring out the sculpted textures. I’m also a little let down by the opaque goggles, but after getting them three times prior, they aren’t that much of a surprise. At least they look good. Falcon includes his flight pack and removable wings, as well as his sidekick Redwing in both collapsed and expanded forms. The wings aren’t posable, but they have a slight curve, which makes them a bit more appealing than the Select version. Redwing is cool, but a flight stand would have been invaluable for him. What’s most notable about the accessories is what’s not there. Once again, he’s missing his two guns, despite his hands clearly being sculpted to hold them. I have to wonder if it’s a weird licensing thing. When I heard this guy was hitting, I searched every Walmart I could, with no luck. Store after store had just Winter Soldier, with no Falcon in sight. I eventually gave up looking, but not before lamenting to Super Awesome Girlfriend how bummed I was to be missing out on Falcon. On Christmas morning, she eagerly handed me a gift, which I quickly IDed as being a Legends figure based on the packaging shape (it’s hard to pull one over on me; I have these things memorized), but I just assumed it was any of the numerous other, easier to find Legends I didn’t yet have. But nope, it was this guy. As it turns out, when I mentioned being bummed, she immediately started looking for him online, and found one for a reasonable price. Yay! Now I have him! Could he be better? Most assuredly. Compared to the likes of Scarlet Witch and Black Panther, he feels a bit rudimentary. Am I still happy to have him? Without a doubt. 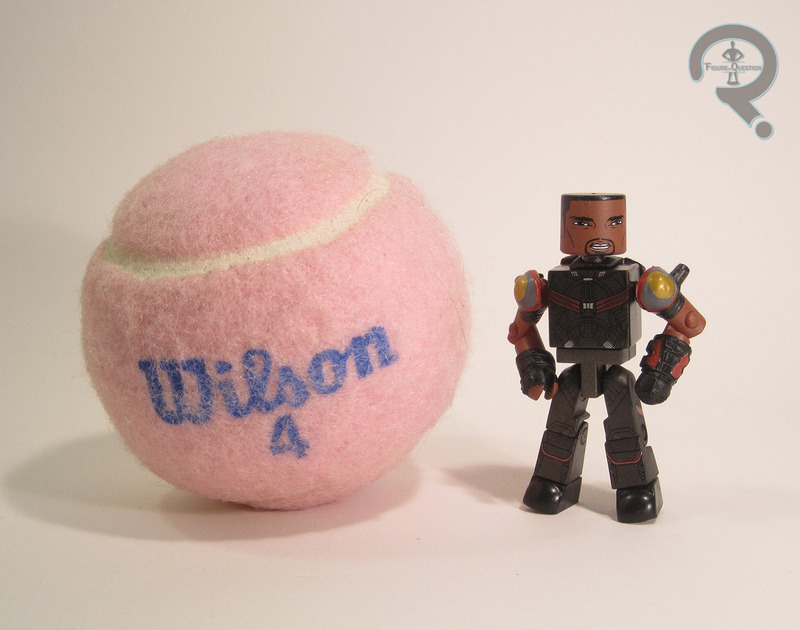 There may be better Falcon figures in the future, but until then, you could do a lot worse than this guy. 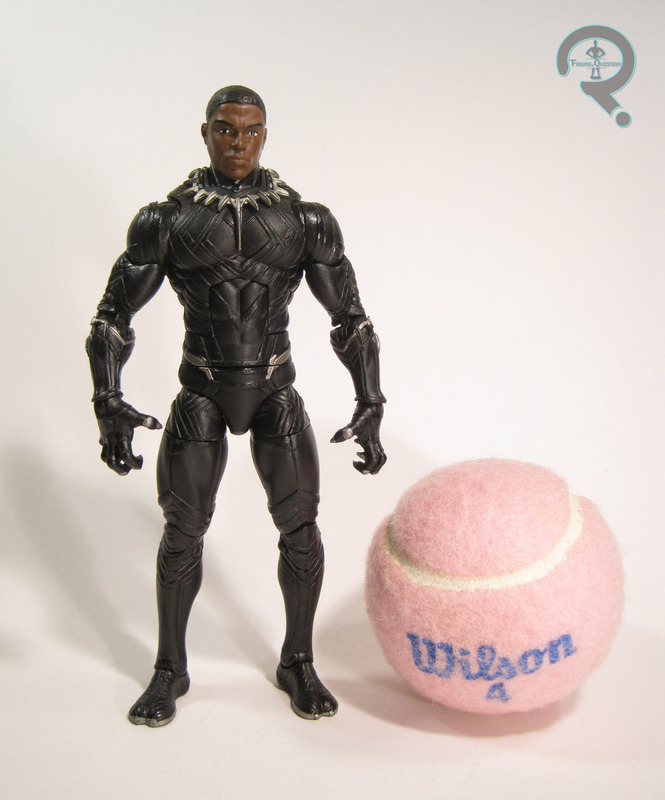 As superhero movies have begun to feature larger and larger casts of colorful heroes and villains, sadly the toys that tie-in with those films have become smaller and smaller. When it comes to the MCU, ever since the first Iron Man (which really only has like, what, four figures you really need to make? 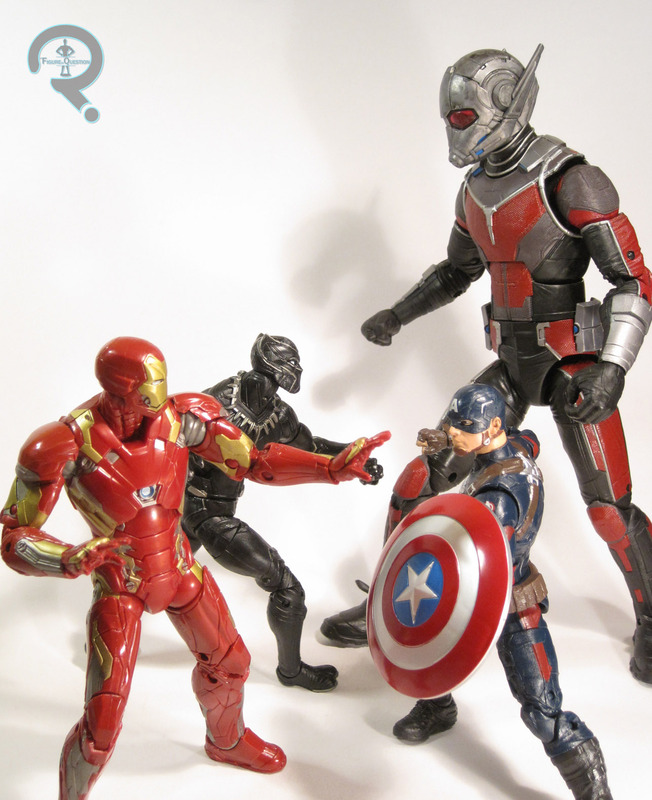 And two of them are essentially the same sculpt), no movie has really gotten a full-lineup, especially not in the 6-inch scale most collectors prefer (Avengers did eventually get there, but only after a few years and additional movies). Age of Ultron came pretty close, giving us the six basic Avengers and Ultron Prime, but the three newest additions to the team were sadly left out. Hasbro’s put quite a lot of effort into getting as many figures as possible out of Civil War, including Scarlet Witch, one of the characters who got left out of the larger Age of Ultron product. I’ll be taking a look at her today! 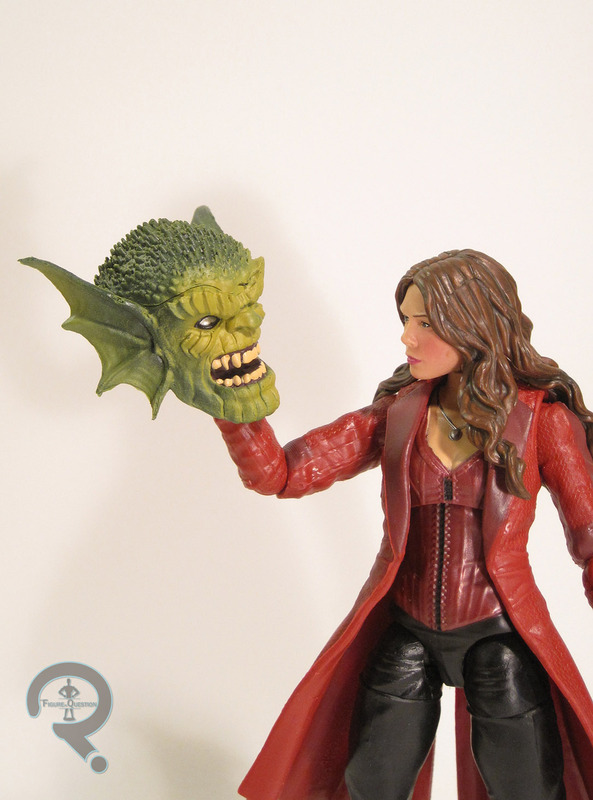 Scarlet Witch is the first figure in the Abomination series, which is the latest series of the Captain America-themed Marvel Legends. She’s this series’ resident movie tie-in, and appears to be the last of the Civil War-based Legends, unless Hasbro pulls a surprise out of their sleeves, but that seems unlikely at this point. The figure stands just under 6 inches tall and she has 27 points of articulation. 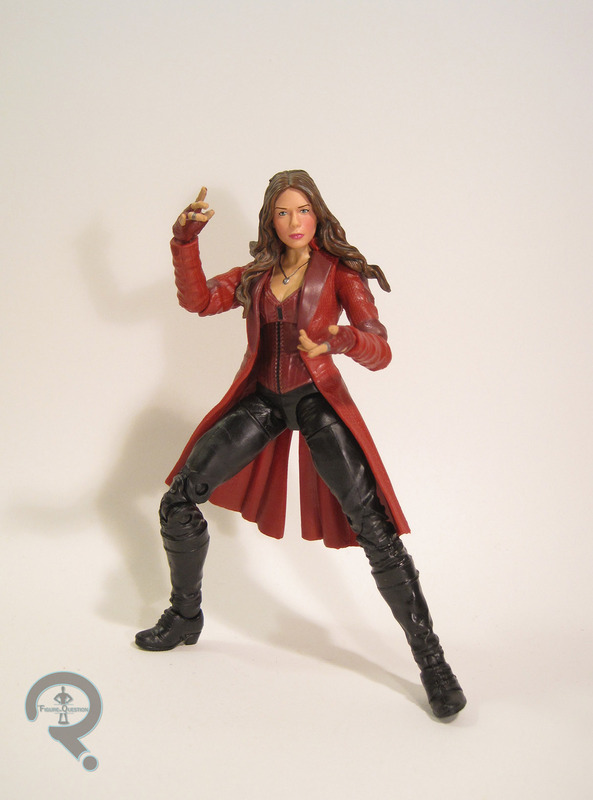 Scarlet Witch features an all-new sculpt, based on her Civil War design. It’s my favorite of the three looks we’ve seen her in so far, so I’m pretty happy about the costume choice. This figure may actually have one of my favorite MCU sculpts (really, only Panther is better, and his was reeeeeaaaaaally good). There are a few small details that are a little off (the shoulders on the coat should really be a little more squared off, but that change probably has more to do with better range of motion than anything), but the overall figure is very accurate. The head’s easily got one of the best likenesses of any of the MCU Legends; there are a few angles where it’s ever so slightly off, but there’s really no denying that this is Elizabeth Olsen. Also, I rarely talk about hands, but the hands on Wanda are pretty phenomenal; they’re perfectly posed to replicate her “spellcasting” look from the movies, and look awesome in a ton of different poses. 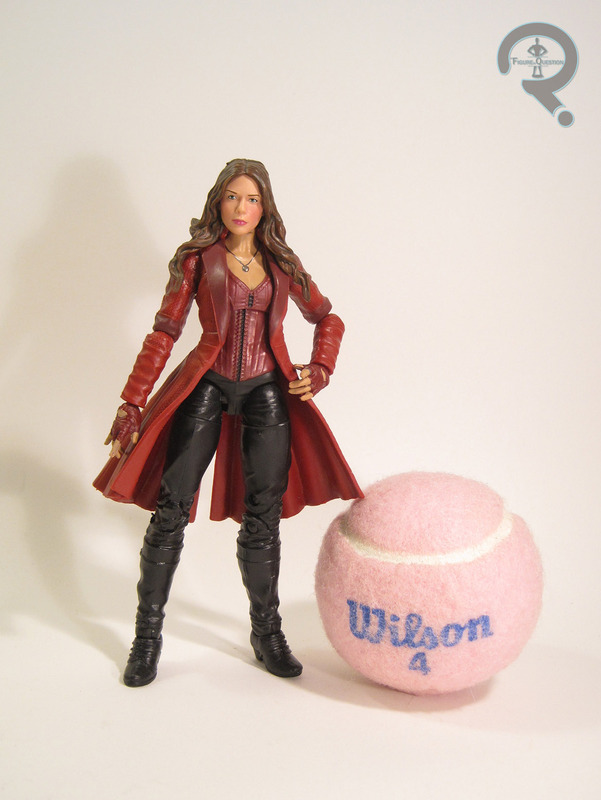 Hasbro’s been trending upwards in terms of paint application, and Scarlet Witch definitely benefits from this. Slop and bleed over is minimal, and the colors match pretty well with the onscreen design. The face in particular is not only very clean, but also has degree of life to it, which a lot of the MCU figures haven’t quite gotten. If there’s one downside to this figure, it’s the accessories. She includes two effects pieces for her hands, which aren’t awful, but don’t really look much like how her powers manifest onscreen, and are just sort of a general step down compared to the effects pieces included with more recent figures. She also includes the head of this series’ BAF, Abomination. This is a figure I’ve been waiting for since Hasbro first showed it off earlier this year. I’ve yet to see this particular series turn up anywhere nearby, and on top of that, Wanda’s by far the most sought after in the set. Her price online was pretty high for a while, but she finally came down to pretty much retail on Amazon, so I ordered her there. I really like this figure a lot, and I’m very happy to be able to add her to my MCU collection. Between her and Panther, I have high hopes for future MCU Legends. There are a lot of different standout characters in Civil War. For a great number of people, it was Spider-Man, and for an almost equal number it was Black Panther. Me personally? Vision and Scarlet Witch all the way. There was also a pretty sizable contingent of people whose favorite bits centered around Paul Rudd’s (Gi)Ant-Man, who made the most of his screen-time. As such, it’s not a huge surprise to see the character turn up amongst DST’s offerings for the film. Alongside him, my favorite character from the last Captain America film (as well as one of my favorite parts of the Ant-Man film), Sam Wilson, aka the Falcon. 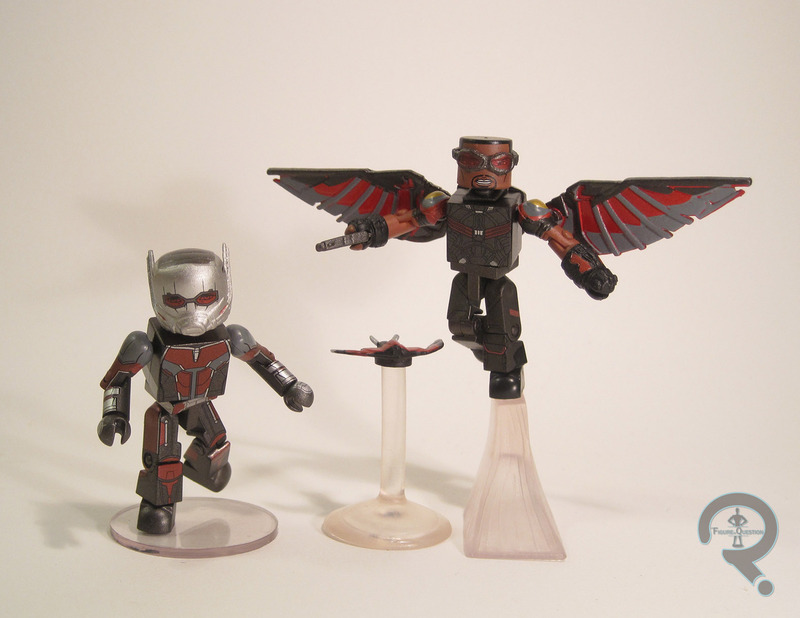 Ant-Man and Falcon are the second TRU-exclusive set for Civil War, and were released alongside Series 67 of the main line (meaning the hit in late July/early August). It’s easily one of the better pairings we’ve gotten so far. Like so many characters before him, Ant-Man was one of those MCU characters who’s costume changed just enough from one movie to the next to warrant a new figure (hey, at least he’s more different than Vision). 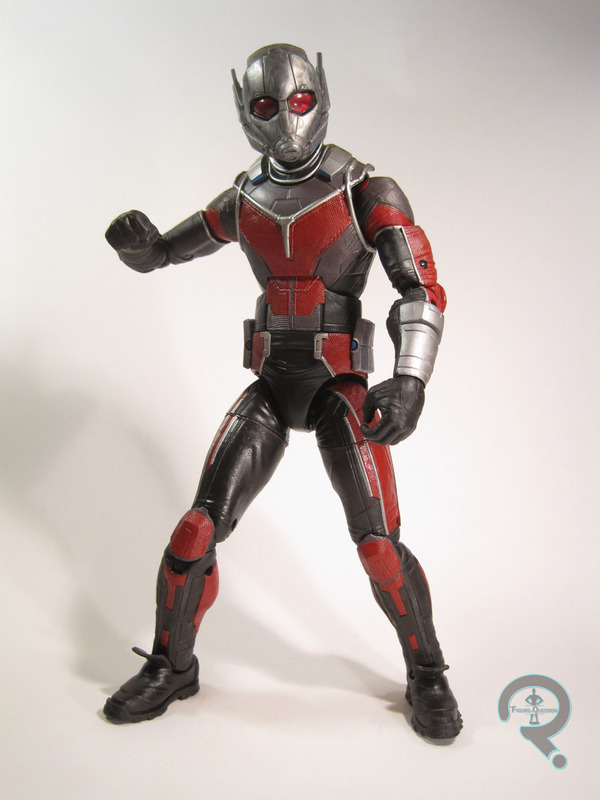 I myself never got the basic Ant-Man from his solo movie (bad me), so this guy was actually pretty cool to get, and I can’t deny that the new design is pretty sharp. The figure is built on the basic ‘mate body, and as such stands a little under 2 1/2 inches tall and has 14 points of articulation. He has one add-on piece for his helmet. It’s new to this particular figure and is a pretty faithful recreation of the helmet he was sporting in the movie. The paintwork on Ant-Man is nice and sharp, detailing all of the various bits of his costume, and overall looking pretty accurate to the source material. 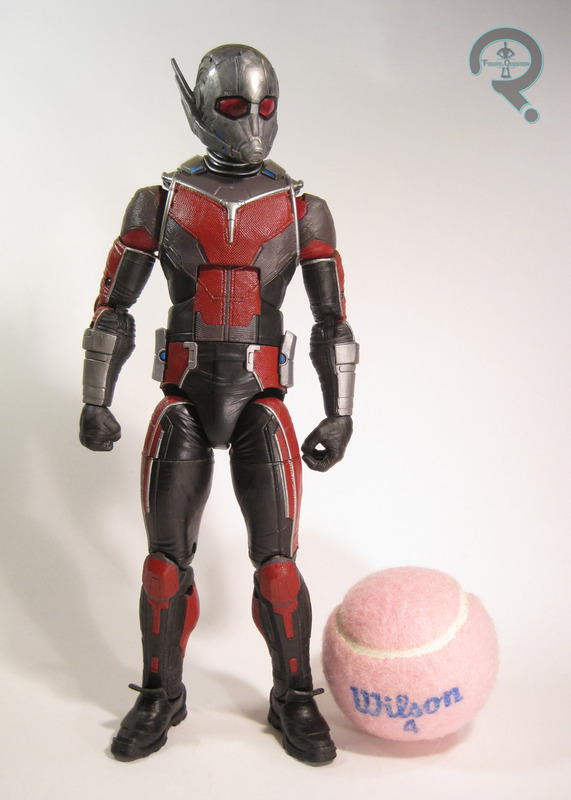 That’s especially refreshing with regards to the helmet, since none of the Ant-Man movie merch got his helmet down right. 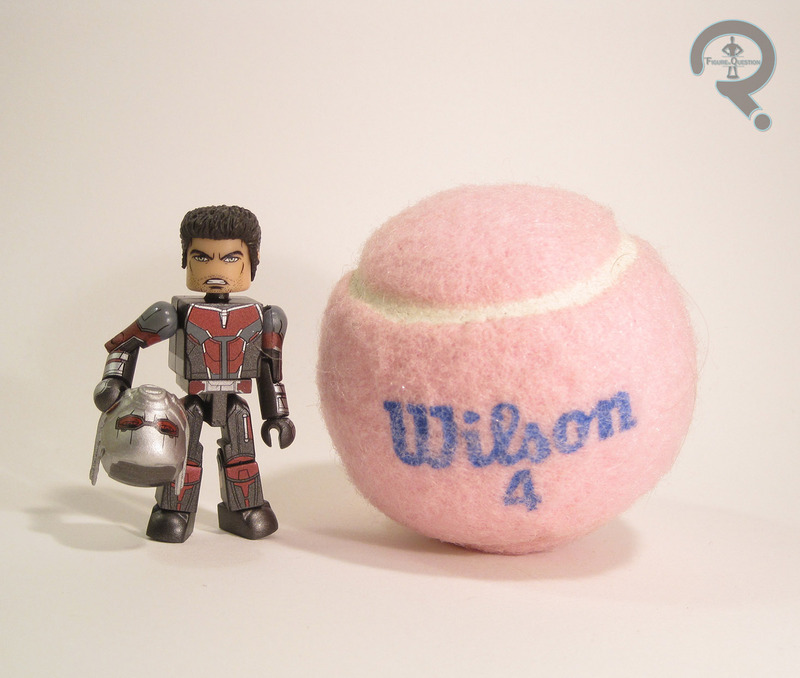 Ant-Man includes a spare hairpiece for displaying Scott sans helmet, as well as a clear display stand. As cool as I think Falcon’s comic book costume is, it’s understandably a little hard to adapt to real life. 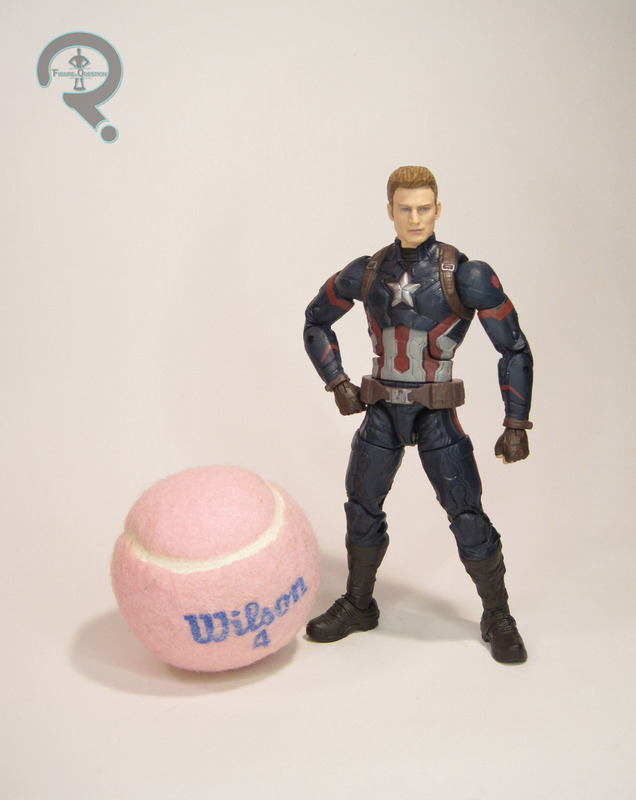 So, it wasn’t much of a surprise that he was sporting more or less real-world fatigues in The Winter Soldier. That being said, it wasn’t the most exciting design. Over the course of his cinematic appearances, his uniform has slowly evolved into something a bit more akin to his comics appearance. His Civil War design is his most exciting yet, keeping the real world nature of the Winter Soldier design, but also adding the the color scheme from his comics incarnation. 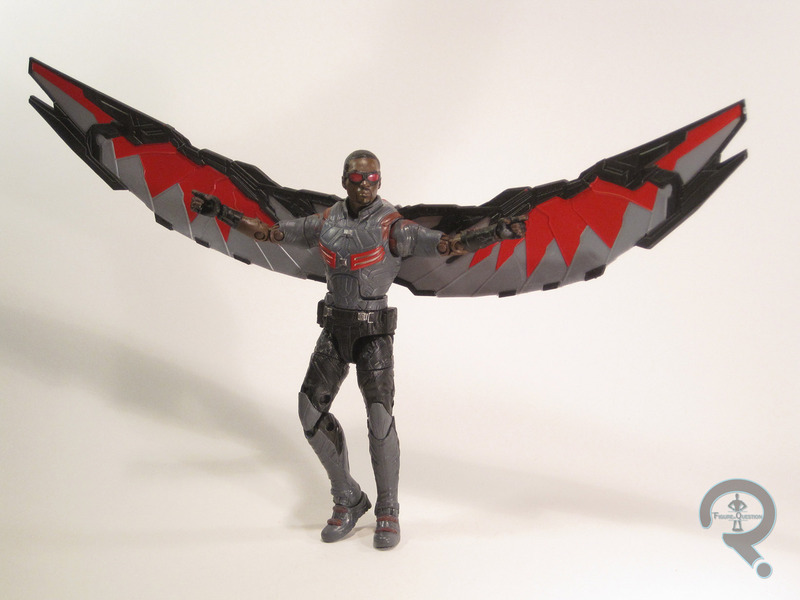 Structurally, Falcon uses add-ons for his goggles and backpack, as well as a unique set of upper arms (with removable posable wings), and two different gloved hands. The end result does a very nice job of converting his onscreen appearance, and improves in a number of ways on the last MCU Falcon (which was already a pretty awesome figure). The paintwork on Falcon is decent, though not quite as clean as the work on Ant-Man. The detail lines are all pretty sharp, and the colors are nice and bright. The only real downside is the sloppiness on some of the basic color work, mostly on the shoulders. The overall look is pretty cool, though. Falcon includes a handgun (why just the one is a little baffling, since he always has two in the film), Redwing, two different styles of flight stands (one for him, one for Redwing), and a clear display stand. I grabbed this set while out and about looking for those pesky X-Men Legends at various TRU’s. I was actually quite happy to find it, since these are two of my favorite characters from the movies (and the comics, truth be told). Ant-Man is a pretty solid addition to the roster of Ant-Men, though he may not be the most exciting ‘mate to people who have the last two ‘mates. Falcon is a really nice improvement over the last MCU Falcon, and even more welcome since that one’s a bit hard to find now. Probably one of best sets to come out of the Civil War Minimates. One of the nice things about the Marvel movies is that their various tie-in products give us a much better coverage of some of the heroes’ supporting casts. This is especially true of Minimates, where the multipack nature of the line allows for more than a few extra characters, who might otherwise get overlooked. I think Captain America has perhaps faired the best of all the heroes. The first movie got us a Peggy Carter and a few of the Howling Commandoes, the second got us the likes of Jasper Sitwell and Batroc the Leaper. Cap’s third film, Civil War, is a bit more jam-packed with named characters, so there isn’t quite as much room for Cap’s supporting cast. That being said, we still managed to get Agent 13, aka Sharon Carter, who is a pretty important character in the Cap mythos! Oh, and there’s like a mercenary or something too. 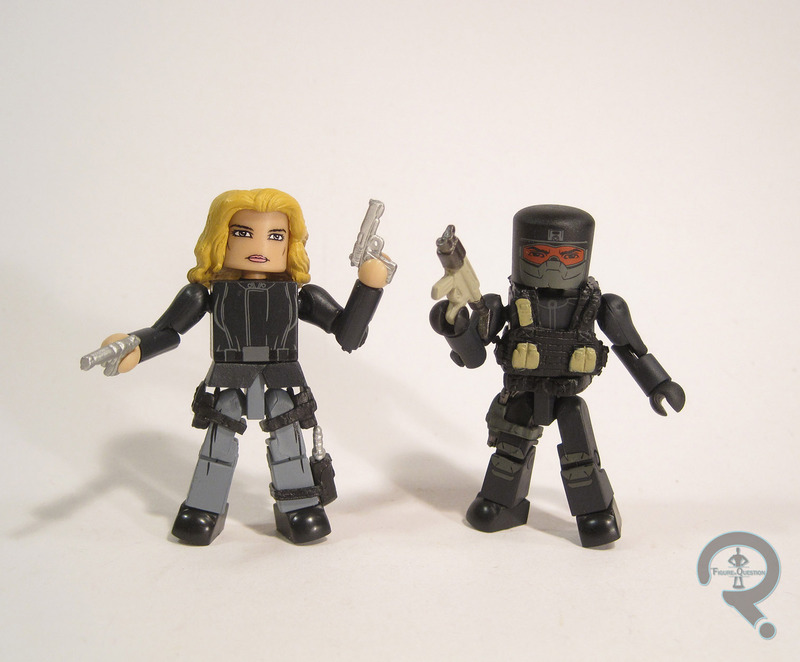 Agent 13 and the Mercenary were released as part of Series 67 of Marvel Minimates, which is the second of the two Civil War-themed sets of ‘mates. 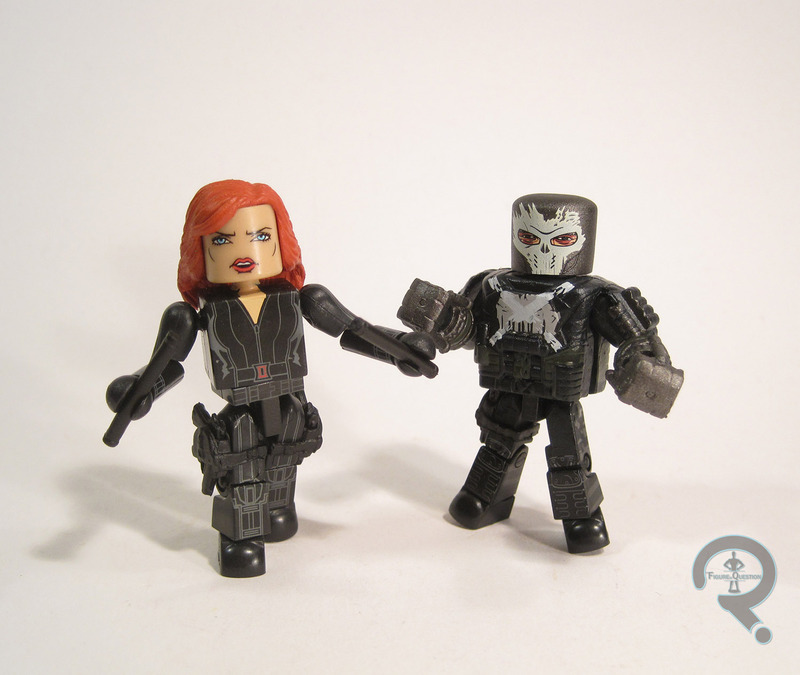 These two are one of the specialty-exclusive packs, alongside the Thunderbolt Ross and Merc set. I’ve been eagerly awaiting this particular ‘mate ever since the character was announced to be in Winter Soldier, so it’s nice to see her finally turn up here. 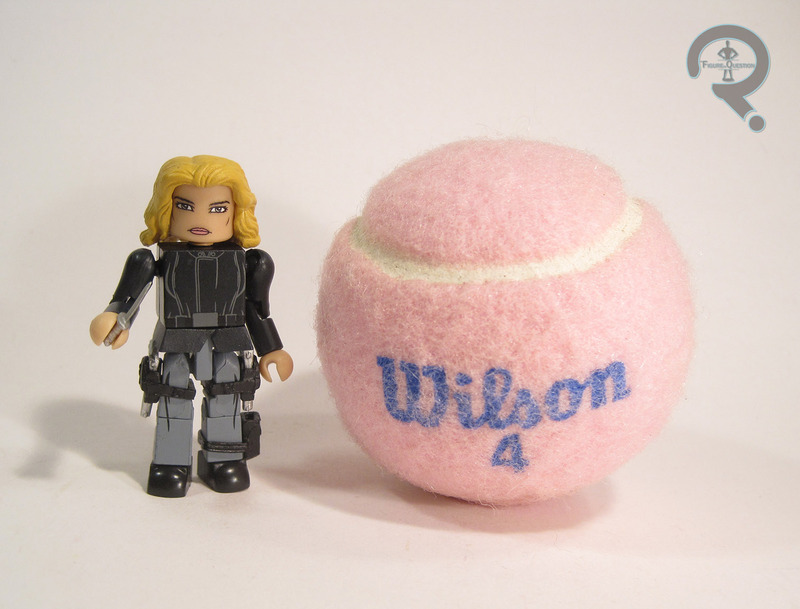 This marks Sharon Carter’s first Minimate, though some of the non-comics geeks might miss that, since she’s only referred to as Agent 13 on the box, including in her bio (which also doesn’t mention her relation to Peggy). I guess Marvel wanted to keep that “reveal” under wraps until everyone had seen the movie. Ah well, Agent 13 sounds cooler anyway. The figure is a little under 2 1/2 inches tall and she has the standard 14 points of articulation. Agent 13 uses the basic ‘mate body, with add-ons for her hair, the bottom of her jacket, the knife sheath and her two holsters. Everything here is a re-use, with the hair coming from Peggy Carter (clever re-use there), the bottom of the coat coming from Kill Bill’s Elle, and the holsters and sheath being standard use pieces. They’re all decently chosen parts. I don’t remember exactly when Sharon sported this look in the movie, but it’s the one featured on all the promotional stuff and concept art, so I can’t complain. As far as paint goes, Agent 13 is pretty standard for a ‘mate. The details are all nice and sharp, and the face bears a passing resemblance to Emily Van Camp. The color palette isn’t the most exciting thing in the world, but it’s accurate. Sharon includes two silver handguns, a knife, and a clear display stand. Ah, yes, the Mercenary. Who could forget the Mercenary? Most people, I’d assume, including me, at least until I re-watched the movie. This is supposed to be one of the guys working with Crossbones at the beginning of the movie. 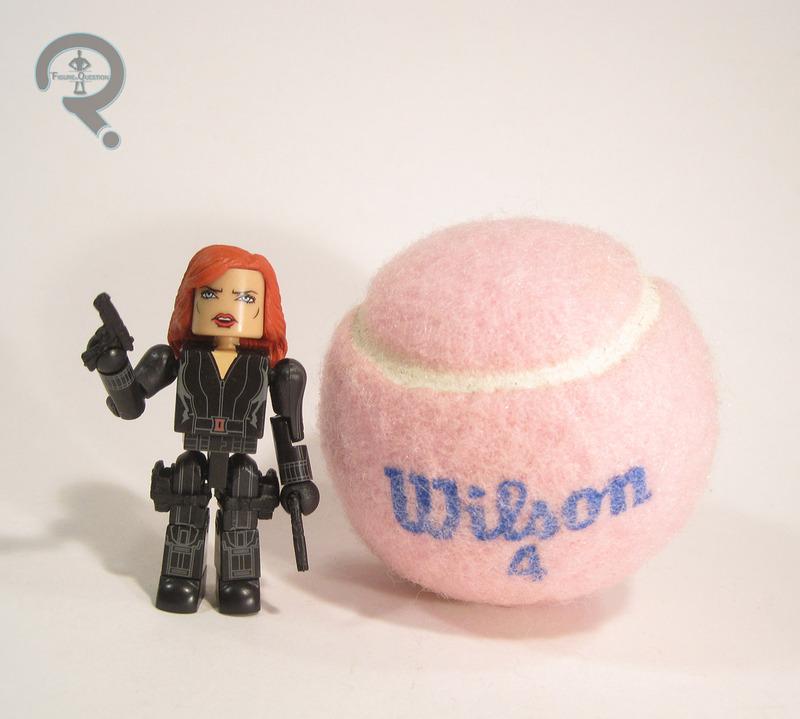 Why this figure was packed with Agent 13 and Ross is anyone’s guess. The Merc is built using the standard body, with add-ons for the mask, tactical vest, belt, and holster. The mask, belt and holster are just standard pieces, and the vest comes from Series 55’s Batroc. The end result looks more or less like the Mercs from the movie, though the mask is more an approximation than anything. One presumes this is due to keeping this guy within budget, which seems fine by me, especially when we’re talking about a generic army builder that’s on screen for maybe 15 minutes. Paint-wise, this guy matches pretty well with what we saw on screen. He’s a little dull in terms of color, but has some nice bits of “pop” like the goggles. The level of detail is pretty impressive, especially for a no-name character. Under the mask, there’s even a fully detailed face, with a buzzcut and everything, which both gives him some extra character, but also can work as more than one guy. The Mercenary includes a sub-machine gun, a handgun (in a dark metal grey), and a clear display stand. So, I got this set at the same time as Widow and Crossbones (who I’m just now realizing I didn’t mention to origin of), courtesy of my parents for my birthday. I was really looking forward to Agent 13, and she’s a pretty solid ‘mate, even if she’s not the most exciting figure ever. I didn’t expect a whole lot from the Mercenary, but I actually quite like how he turned out. He’s a nice accent piece for yesterday’s Crossbones. Huzzah! We’ve made it to the final part of Giant-Man Week! It’s time for the literal big guy himself, Giant-Man. Giant-Man was probably one of Civil War’s worst kept secrets, thanks to both this figure and the Airport Battle Lego set. It’s not like it was a huge shock or anything, and the actual moment from the film was hardly diminished by knowing ahead of time. Anyway, Giant-Man is (pardon the pun) one of the bigger things to come out of Civil War, and as such, he’s found his way into quite a good bit of merchandise. However, this is the first proper movie Giant-Man action figure, so let’s see how he turned out! Giant-Man is the build-a-figure for the Giant-Man Series of Marvel Legends. I know, who would have seen that coming? He’s obviously based on his appearance in Captain America: Civil War, specifically the airport scene. The figure stands 10 inches tall and he has 30 points of articulation. Giant-Man is another all-new sculpt. It’s pretty decent work, with a slight caveat. The figure offers a decent approximation of his design from the movie, but, like with the Ant-Man figures from the solo movie, this guy kind of misses the smaller details. Well, not misses, so much. All the details are there, but they’re sort of out of place. It’s not a bad look at all, just slightly inaccurate. But hey, this is what happens when you keep a main character’s look under wraps for so long. It’s certainly not a bad sculpt, though. There’s a lot of really great texturing on his suit, and he’s got nice, balanced proportions. I particularly like the use of a separate piece for the faceplate, which allows for Scott’s eyes to be seen beneath the lenses. It’s a really cool look. Giant-Man’s paintwork is pretty solidly done. The colors are all good matches for the movie, and everything is nice and cleanly applied. The silver could, maybe, be a little brighter, but it looks fine as is. As an accessory himself, Giant-Man doesn’t include any extras of his own, though I can’t really think of much you could give him. Maybe a chunk of plane? As a build-a-figure, Giant-Man is the result of a few weeks of searching for all the figures in this series. I think he may be one of my favorite B-a-Fs in a a long time. In general, this whole series was really strong. The line-up seemed a little odd at first, but almost all of the figures are top-notch work, especially in terms of paint! Which has been one of Hasbro’s problem areas. We’re now four days into Giant-Man week. Today, we’ll be looking at my favorite figure from the set. Oops. Spoilers? Ah, you’ll get over it. Anyway, Black Panther was by far the coolest thing to come out of Civil War (which is saying a lot, because Civil War had *a lot* of cool things in it). 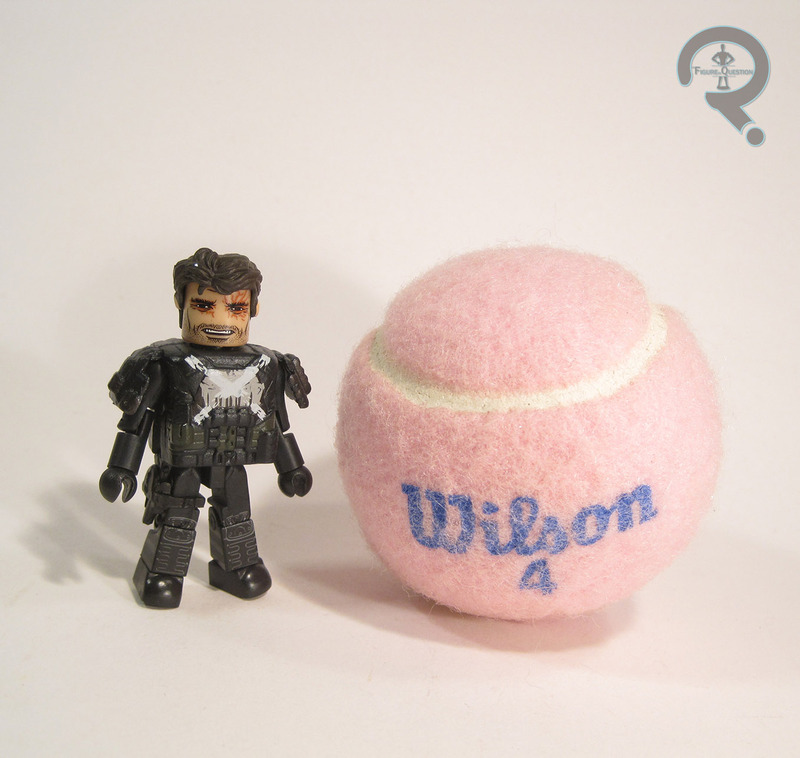 As of yet, merchandise of him has been a little difficult to find. I’ve looked at Hasbro’s smaller figure and the Minimate, both of which were pretty cool, but still left me wanting just a little bit more. My most anticipated Panther figure was the Marvel Legends version. It’s been a bit of a wait, but he’s finally here! Does he live up to the expectations? Well, duh. 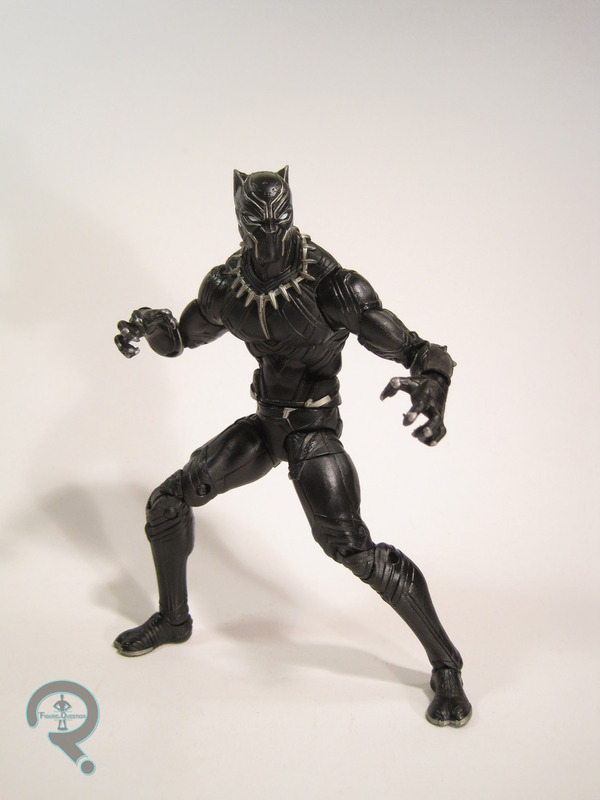 Black Panther is figure 3 in the Giant-Man Series of Marvel Legends. He’s the third of the three Captain America: Civil War-based figures from the series (not counting the build-a-figure, of course). Of course, Panther ended up with one of the most faithful costume translations in all of the Marvel movies, so there’s no reason this guy couldn’t pass for a comic Panther too. The figure stands 6 ¼ inches tall and he has 30 points of articulation. 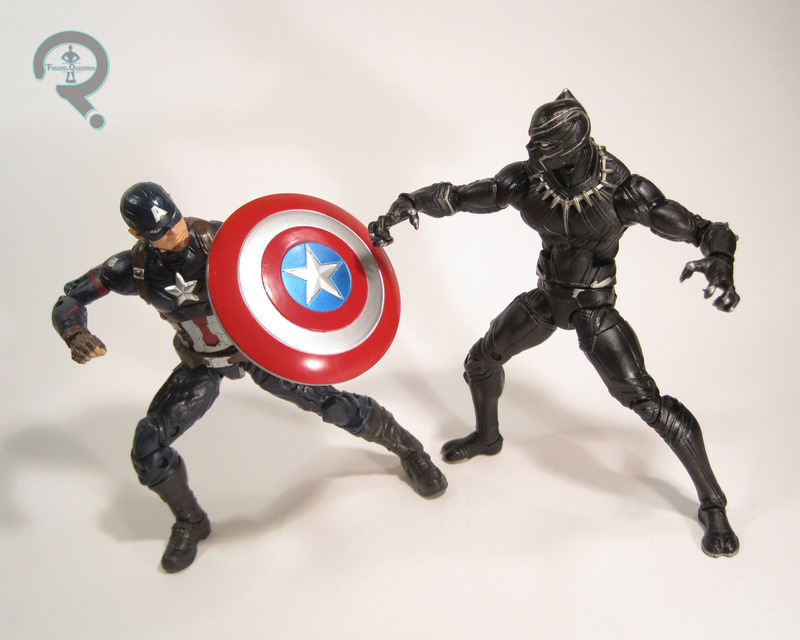 Like the Mark 46, Black Panther sports a completely new sculpt, and an impressive one at that. Not only is his musculature nicely proportioned and balanced, but he’s also a pretty much perfect match for Panther’s build from the movie. On top of that, ever bit of this guy is covered in sculpted texture. Panther’s suit looks like it’s made from an actual woven material, which at this scale is immensely impressive. Even the hands are well done, offering a cool claw bearing pose that works really nicely with the figure’s articulation. The sculpt also manages to work in all of the articulation in a way that disrupts the sculpt as little as possible, which is greatly appreciated. Panther’s paintwork is rather on the minimalistic side, but what’s there is quite sharp, which is good, because imperfections in the paint would be rather obvious due to the highly contrasting natures of the colors. This is one of those times where less is more with the paint, because the lack of superfluous painted details allows the finer parts of the sculpt to really shine. Panther includes an unmasked T’Challa head, which has pretty nice likeness of Chadwick Boseman. Oddly, the head lacks his slight bit of facial hair. 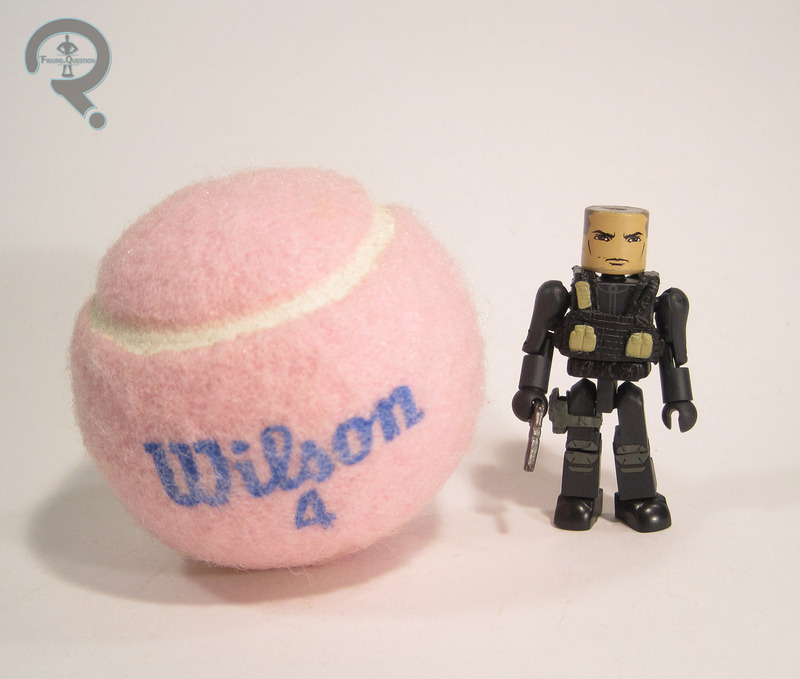 The Minimate has this same issue, so it’s possible that he was clean shaven in early shots. Panther also includes the left leg of Giant-Man. I wouldn’t have minded some extra hands as well, but the extra head is certainly a cool extra. Panther is the figure I’ve been most looking forward to in this set. I’m not alone in this, however, causing him to be the most difficult figure to find by far. Fortunately for me, my local TRU got in a case of this series right before my birthday, when I just so happened to stop by. Panther ended up being bought for me by my boy Tim. This figure not only lives up to my expectations, it actually manages to exceed them. The sculpt is great, the movement is great, and even the paint is pretty great. Hasbro really upped their ante on this guy. Let’s hope they can keep it up!